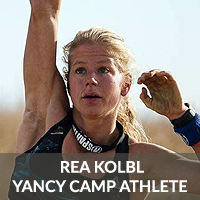 Premier OCR Athlete Rea Kolbl - Yancy Camp - Fitness for Everyone! My name is Rea Kolbl, I am 26 years old, and I’m in love with obstacle course racing. Sports have always played a big part in my life. I grew up in Slovenia where I spent my childhood mostly in the gym, competing for 10 years on the Slovenian National Gymnastics Team. In 2010 I moved to the United States for college where I picked up trail running. Between 2012 and 2016 I competed in several trail ultramarathons, winning 6 races, setting 5 course records, and winning my age group at a 50 mile trail race. In 2016 I discovered obstacle course racing, which perfectly blended my childhood obsession with my current passion of trail running, and I’ve never looked back since. In two full years on the obstacle course racing circuit I have had a blast while winning 15 Spartan Races and finding my way on the podium appx 30 times. In 2017 I won World’s Toughest Mudder and took 2nd place at the Tougher Mudder Championships. In 2017 I completed my Master’s degree in Materials Science and Engineering at Stanford University, and with that I moved to Boulder, Colorado, to focus on my athletic career. I hope to inspire others to join me in the mud, and to show the next generation of girls that “like a girl” means strong, powerful, and fast.